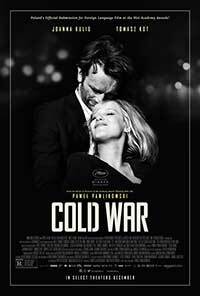 A three-Oscar nominee from Poland, Cold War is a retro-styled black-and-white film in a 1.37:1 aspect ratio that very much recalls movies of the 1950s and 1960s period in which it is set. Writer/director Pawel Pawlikowski weaves an engrossing and heart-rending love story spanning the first two decades of post-WW II Eastern Europe when images of Stalin dominated the landscape of countries still recovering from the devastation wrought by the Nazis. Music director Wiktor Warski (Tomasz Kot) and his assistant Irena (Agata Kulesza) supervise auditions for a Polish state-sponsored folk music ensemble. Wiktor spots the much younger and attractive Zusanna “Zula” Lichon (Joanna Kulig), an enterprising “it” girl burdened with a criminal record. The Wiktor-Zula relationship quickly heats up during a Communist-sponsored tour of European capitals. Manager Lech Kaczmarek (Boris Scyz) sees the ensemble’s propaganda-laden programs as an opportunity for self-promotion while Wiktor sees these shows as an artistic dead end. While on tour with the group, Wiktor offers Zula a chance to escape to Paris with him but, when she fails to show, he leaves by himself. In Paris, Wiktor establishes a mediocre career as a jazz club pianist and film score conductor, and Zula has married a Sicilian to obtain a travel visa and reconnect with her lover. Their new life together is undermined by Zula’s jealousy about Wiktor’s past affairs and she has acquired serious drinking problem. Zula makes a successful recording and, after a brief affair with Wiktor’s record producer Michel (Cedric Kahn), she abruptly returns to Poland. Against advice from Kaczmarek, Wiktor also returns to his homeland only to receive a lengthy prison sentence during which the guards maim his precious hands. Zula has married Kaczmarek and borne him a son but is now an inveterate alcoholic. She obtains Wiktor’s release from prison but there appears to be no hope for these tragic lovers in a country that has done everything possible to crush their spirits. Pawlikowski and his co-writers Janusz Glowacki and Piotr Borkowski have crafted a script that perfectly captures the zeitgeist of Soviet repression that left many casualties like Wiktor and Zula in its wake. Thirty years after the Solidarity movement brought down Poland’s harsh Communist rule, it is hard to imagine what living conditions were like during the Cold War, and Pawlikowski, in recalling his own family’s story, brings all of it rushing back. Cinematographer Lukasz Zal deserves equal billing with this superb cast as his cameras create indelible images like the ruined church that that opens and closes the film. As a side note, lead actor Tomasz Lot bears a striking resemblance to the Polish ex-pat Pawlikowski, while Joanna Kulig could pass for Pawlikowski’s attractive wife Malgosia Bela, casting decisions that were probably intentional. Cold War competed against eventual Oscar winner Roma for Best Foreign Language Film and had a limited US theatrical release just long enough to qualify for the 2019 Awards Ceremony. Thankfully, Amazon Prime Video now gives viewers a chance to see what I felt was easily the better of these two pictures. Highest recommendation. A heartrending account of tragic love set against the backdrop of Cold War Poland as a stellar cast and direction draw audiences tightly into this era and maintains its grip until the bitter end. A contender for Best Foreign Language Film at the 2019 Oscar Awards ceremony that should have gone home with the prize.